Newcastle United soccer fans are one of most loyal football fans in the world, week in week out the Toon Army turn up to support their team no matter what division they are in and the people of Newcastle feel the same way about their home town group called Lindisfarne. This British rock group from the 70’s took their name from the little tidal island off the north~eastern coast of England known as Holy Island. Signing to the great Charisma record label in 1970 run by the legendary Tony Stratton Smith, their label mates included Genesis, Peter Gabriel and The Nice featuring Keith Emerson. 1970 saw the release of their debut album ‘ Nicely Out Of Tune ‘ a classic folk / rock album which features the song ‘ Lady Eleanor ‘ which became a hit nine months after its initial release date. The album is great , full of great songs and harmonies and has a football sing ~ along atmosphere on some tracks. There is not a bad track on the entire album. 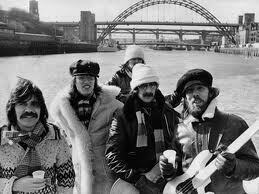 Next album for the band was ‘ Fog on the Tyne ‘ and sometimes the second album can be a let down after the success of the first one as the band is usually on the road touring and have less time to write new songs. Produced by Bob Dylan producer Bob Johnston this is another classic folk rock album from the band and features the top ten single ‘ Meet Me On The Corner ‘ and with the title track both songs became highlights of their live shows. A heavily reworked version of the title track with vocals by footballer Paul Gascoigne another Newcastle legend was released under the title ‘ Fog On The Tyne ( Revisited ) credited to Gazza and Lindisfarne. It reached No. 2 in the UK charts in 1990. 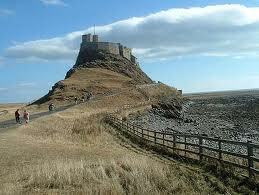 Lindisfarne were blessed with great singers in Alan Hull, Rod Clements and Ray Jackson. In fact Ray Jackson played mandolin on Rod Stewart’s mega hit ” Maggie May ‘ but Rod forgot his name on the credit on the album. John Peel was used miming on the TV show Top of the Pops playing mandolin, so Ray missed out twice ! Alan Hull was the main songwriter and was a huge talent. On the release of their 3rd album the excellent ‘ Dingly Dell ‘ which was sightly savaged in the UK music press, Hull decided to leave to leave the group and pursue a solo career. In 1973 Alan Hull released ‘ Pipedream ‘ which was like a new Lindisfarne album as three of the band are playing and singing on it! This album is worth finding and features a brilliant distinctive artwork sleeve on the cover as is the album, also ‘ Back To Basics ‘ where Alan Hull plays acoustic versions of his songs from 1970 onwards is worth finding. After a brief hiatus, Lindisfarne decided to reform again with the same line up. They hit the charts again in 1978 with the catchy ‘ Run From Home ‘ , but the momentum had been lost and the spirit was not the same. While working on a new album in 1995, Alan Hull died suddenly from a heart thrombosis. A sad loss, but at least Lindisfarne and Alan Hull left behind a great selection of songs for us to listen too. We Can All Swing Together !